Enjoying the Beauty of Branson on Horseback! The expansive landscape of mountains, hills, valleys, lakes, and forests found in and around the Branson area is a stunning sight to behold, especially while horseback riding! This gorgeous, multi-use state maintained forest is just a few miles north of Branson. If you have your own horse, a nice section of the extensive acreage of Busiek State Forest is accessible by trail. Busiek has 18 miles of maintained trails shared by hikers, horseback riders, and bicyclists. You'll encounter a lovely river along Busiek's marked trails, areas of which can be navigated in warmer weather. Bear Creek - Ideal for Beginners! Bear Creek Stables is located in the small picturesque community of Walnut Shade, just 10 minutes from Branson. Bear Creek offers a relaxing one-hour guided ride in beautiful Walnut Shade. With gentle, well-trained horses, this ride is perfect for beginners while still being very enjoyable for the skilled rider. You'll be guided on a relaxing walk that crosses pastures, meanders through wooded areas, and climbs up and down a few hills. You'll even see a pretty waterfall during your Bear Creek adventure! Ozark Mountain Trail Rides is located on the gorgeous and historic Shepherd of the Hills Homestead. The same property where you'll find the long-running, famous outdoor drama based on the best-selling book, The Shepherd of the Hills. 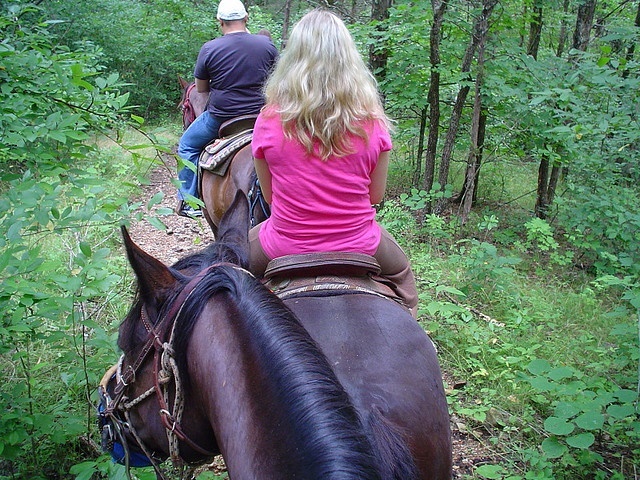 Ozark Mountain Trail Rides offers a one-hour horseback tour through the lovely Ozark hills. It's a mostly shaded area, so even summer-time riding can be pleasant, and the horses are exceptionally gentle and well cared for, and expertly trained. Your journey will include seeing the Old Mill Theater where the outdoor drama is performed, and you'll even be riding one of the drama's featured actors. Yep, that's right; you'll be riding a horse used in the show! Delight in the Protected Landscape of Dogwood Canyon! Dogwood Canyon boasts 10,000 acres of carefully cultivated and protected Ozarks' land, with much of its pristine acreage available for viewing from horseback. At Dogwood Canyon, a wrangler guides you on a two-hour trail ride that includes winding valleys, rolling pastures, and ridge tops with a 360 degree view of the Ozarks. On most trails, you'll encounter some wildlife; on this journey, you'll actually see buffalo and longhorn cattle! You can also discover the ultimate cowboy experience; gathering a herd of colorful Texas Longhorn and driving them to greener pastures. After which, you'll settle in for a hearty meal at the chuckwagon site. As you can see, enjoying Branson and the Ozarks on horseback is easy for the seasoned rider and novice alike!